A complete line of unique square-holed Torque Washers is now available from WCL Company. The square-holed washer is designed for use with a carriage bolt. Four bent prongs on the washer can be embedded in wood, plywood and other ductile materials, making the washer self-retaining during assembly. The finished square hole in the washer mates with the square shoulder on the carriage bolt. As the washer is fixed in place, the square shouldered bolt is prevented from rotating. The washer also provides a smooth bearing surface and distributes the fastening load, preventing embedment in the soft material and the splitting and loss of holding power that can result. 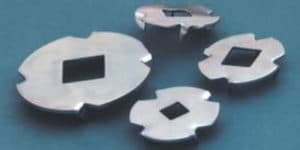 WCL stocks Torque Washers with square inside diameters of 1/4″, 5/16″ and 3/8″ in a 1″ O.D. and a 1/2″ square hole washer with a 1-3/4″ O.D. Also available soon are 5/8″ and 3/4″ square hole with a 1-3/4″ O.D. Standard Passivated Finish unless otherwise specified.